Ask A Buddhist: What About Myanmar? Your confusion about the contradiction between Buddhist teachings and the behavior of Buddhist monks in Myanmar is understandable. If, indeed, your dad has instilled Buddhist values as part of your life training, then you have a good ethical foundation to work from. This kind of desire admires things that are worthwhile—like love and compassion—and inspires us to make effort to abandon afflictions and dukkha, and establish true peace in our mind. Ask A Buddhist: Who, What is Buddha? Shakyamuni Buddha, who lived 2,600 years ago, was once an ordinary being just like us. When initially exploring Buddhism, we can be both a practitioner of Christianity and Buddhism. 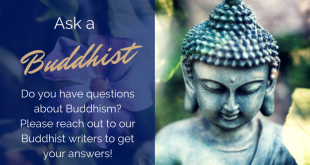 "Becoming a Buddhist" means studying the Buddha's basic teachings, thinking about them, and testing them with your own experience.